Our Boats. Our Fish. From our fishermen direct to you. We are proud British Columbian's striving to be leaders in sustainable fishing practices. Welcome to Finest At Sea Ocean Products Ltd. We are the leading provider of the finest quality seafood on the West Coast. All our products are 100% wild and are caught by our own fishermen through sustainable fishing practices. We have been operating since 1977 as F.A.S. Seafood Producers Ltd. Finest At Sea was established as a ‘boutique-style’ seafood company here in Victoria and has expanded to several locations in Vancouver. As a young boy, Bob Fraumeni was fascinated by the sea. He spent countless hours fishing in Gonzales Bay in Victoria, peering into the ocean, wondering what was down there. Although he wasn’t born into a fishing family, he was drawn to the sea. As he got older, a teenage Fraumeni began hanging around the busy docks of Victoria’s Harbour, which at the time had three fish processing plants in full operation. In 1977, Bob bought his first boat, a 36-foot West Coast troller designed for Salmon fishing. However, even as he set out on his first trips, Bob Fraumeni knew the salmon industry was going downhill. “I realized it was time to branch out to other fisheries - especially ground fish,” Bob recalls. By 1984, Bob’s company had grown and was established as a limited company called F.A.S.Seafood Producers Ltd., which stands for ‘Frozen At Sea.' F.A.S. now has 8 boats plying the seas, catching everything from Halibut up in Haida Gwaii to Albacore Tuna off the West Coast of Vancouver Island. After selling exclusively to the Asian Market for many years, Bob was eager to make his high quality products available locally. ‘Finest At Sea’ was established as a boutique-style seafood company with locations in Victoria and Vancouver, B.C. Bob recognized your need for a source of top quality, 100% wild seafood products of known origin and now the Finest At Sea Products are just a phone call away. 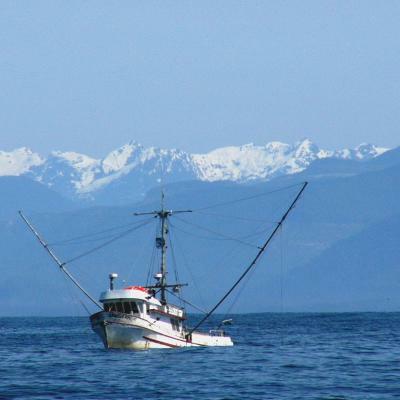 Finest At Sea has ten large offshore fishing vessels, including the FV: Ocean Pearl, the largest vessel in the B.C. fishing fleet. Our vessels are equipped with cutting-edge, deep cold (-60º) freezing systems. As any experienced fish buyer knows, freshness can only be guaranteed when the time between expiration and freezing is measured in minutes. Our massive 130ft ship leads our fishing fleet. The 'Ocean Pearl' is responsible for catching Blackcod, Halibut, Rockfish, and Tuna. Our Queen reels in Spring, Coho, and Pink Salmon for us. The Malahat isn't just the stretch of highway between Victoria and Duncan... it also is the name of a member of our fleet! This ship brings in Spring, Coho, and Pink Salmon for us. This member of our fleet, the 'Nordic Spirit', hooks Spot Prawns and Tuna for us. The 'Hanna Lio' is responsible for catching Blackcod, Halibut, Rockfish, and Tuna. The Star Wars II is one of our largest ships, but it packs one of our smallest fish: herring. Beyond Herring Packing, the Star Wars II also brings in Halibut for all of you to enjoy. The 'Dovre B' is an expert angler of Blackcod, Halibut, Rockfish, and Tuna. You can find the 'Nordic Rand' sailing up and down the coast of BC reeling in Spot Prawns, Tuna, Blackcod, and Halibut. This Tuna-catching machine finds its home south of the border as part of our US fleet. The 'Conquest' makes up the other half of our US fleet. Four-ounce fillet, golden batter, served with lemon, house-made tartar, and coleslaw. Grilled four-ounce fillet on a portofino pretzel kaiser bun with house made tartar and fixings. Two flour tortilla with tomato and corn salsa, coleslaw, house-made chipotle mayo and your choice of fish. House-made New England-style chowder with halibut, salmon, shrimp, smoked fish, herbs, and vegetables. We at Finest at Sea take great pride in the service that we provide to all of our customers. If you have any questions, concerns, or comments please let us know below! Join our e-mail list to be the first to hear about special offers and incredible stories.